Item # 310526 Stash Points: 2,995 (?) This is the number of points you get in The Zumiez Stash for purchasing this item. Stash points are redeemable for exclusive rewards only available to Zumiez Stash members. To redeem your points check out the rewards catalog on thestash.zumiez.com. Step up your casual style in the Lux Black Bucket Hat from DGK. This bucket hat comes in black and features light grey DGK branding repeating throughout. Red and green taping Is sewn around the crown for a high-end look, and a woven DGK logo patch is displayed on the front. With a soft, unstructured design, this hat is sure to tie all of your casual looks together. 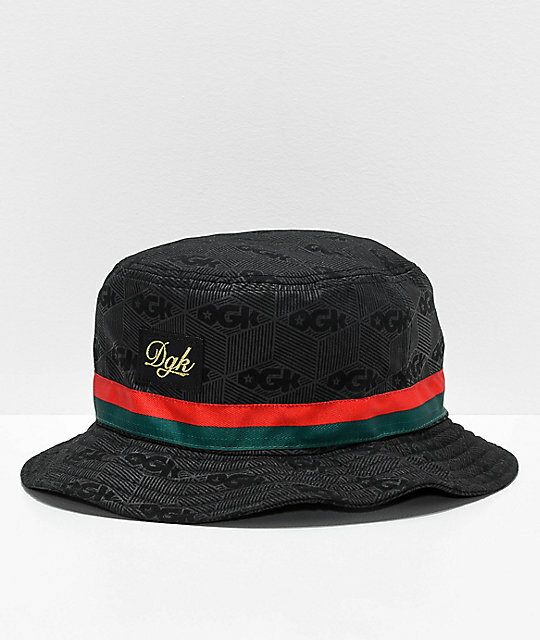 Lux Black Bucket Hat from DGK. Black with light grey DGK print pattern throughout. Red and green taping around the crown.